There has never been an easier time to share your message, fight for a cause or establish visibility for your expertise. But it isn’t enough to share your opinion online and expect to be able to cut through all the noise that is out there. To truly create maximum impact, remember these 4 tips to build a movement that people can learn from and then choose to stand with you. At the foundation of every movement is the desire to solve a problem. Your ability to successfully build a movement will be determined by your ability to create value and solutions for a large number of people. All successful businesses solve a problem or serve a need. And all movements are born from a need or problem that someone feels passionately enough that there needs to be a solution. Whether social, political or profit driven, the first step to create and build a movement is to identify what problem your movement solves. Movements are developed out of some need and they are also birthed in emotion. People are frustrated, upset or tired of whatever is causing them pain. People who join your movement will be able to connect to it because of this emotion. But emotion isn’t enough. The difference between a riot and a movement is that a movement employs logic and productive skill sets to create positive change. Movements are often born out of spontaneity. However, your ability to be successful as you lead and build a movement will be rooted in creating longevity. How can you stay visible and relevant? 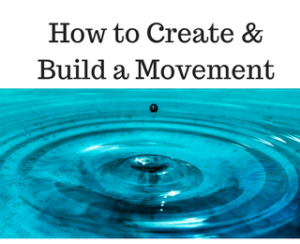 A key ingredient here is in making it easy for others to join your movement. Can they find you easily online? Do you give them the ability to “opt-in” to the movement in some capacity such as engaging in an online group or gathering live? Once they join, keep the momentum growing by continuing to engage with them in a meaningful way. To truly create maximum impact, a movement needs to have results in some form of lasting change. Once you’ve identified your problem, it is important to identify what needs to be different to solve that problem. For people who join your movement, it will be easier to advocate for and engage others in your movement if you can show progress towards that specific result. Not all movements are created out of the need for social change. The solution your business offers can be the starting point for a movement for those who who can be positively benefited by it. Remember to Play Big, Be #1 in Your Field, Live Your Legacy, and Create Maximum Impact.